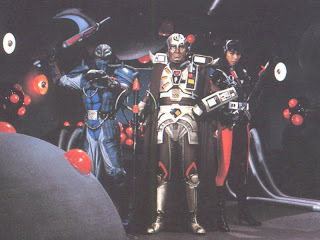 I just finished Dengeki Sentai Changeman and added it to my list of Super Sentai series I've watched from start to end. I admit that I'm enjoying Kyuranger and I can't wait for tomorrow's episode. On the other hand, I've just watched more of Changeman with subs courtesy of LordTranza33. I had some grueling moments downloading it but I came out victorious in the end. So let's get started shall we? Warning! There's some spoilers ahead unless you're a spoiler addict like me! I remembered how often Shogo B'Stard praises this show. I see why he would. Although I've had some varying opinion differences with him and yes, we "clash" at certain moments since I like Timeranger, Hurricanger and Boukenger when he doesn't. But I could agree with him with Changeman as a really innovative series. This was the time of Hirohisa Soda before he eventually met his downfall midway Turboranger and really burned out bad in Fiveman (but I still like both shows but not as much). I admit a lot of my favorite series in the past are written by Soda and that I think the pre-Soda era don't drive my interest that much. Changeman is one series where rangers were once tough ahem tougher than nails before censorship started to get stricter after Timeranger. Ah those were the old old days when Super Sentai didn't feel so kiddie. My personal favorite is Tsurugi Hiryu or Change Dragon. I also remembered a bit of jokes I played with how Shou Hayate and Yuuma Oozora's actors Kazuoki Takahashi and Shiro Izumi (who'd later come back to play as Burai in Zyuranger) look like Filipino actors Robin Padilla and Rustom Padilla. The women here are also pretty tough. Sayaka Nagisa and Mai Tsubasa show a lot of backbone considering they're in the military. As far as character development is concerned, I do like them all. I thought about how Hiryu becomes my favorite due to his clashes with Buuba and Giluke. I could also talk about how maybe, just maybe my second favorite is Shou. Shou sort of reminds me of my dumb motives and how he goes from a superficial character to a more mature character. 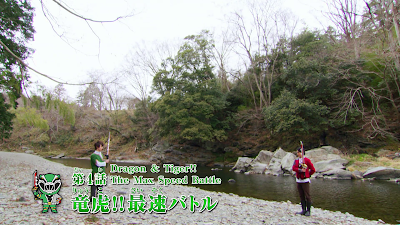 Too bad though he never got a bigger guest role in Kaizoku Sentai Gokaiger. Yuuma looks like he's inexperienced (at first) but it's fun seeing him develop as a fighter. 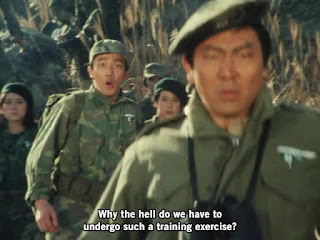 I could relate to myself to him in the episode he's looking for the Earth Force. Sayaka appears to the team genius like when she invented the anti-gravity belt and she had a slight shiptease with Tsurugi in that episode. Mai is pretty much a break from the stereotypical more feminine but tough pink. I still wish she could be together with the doctor she fell in love with. 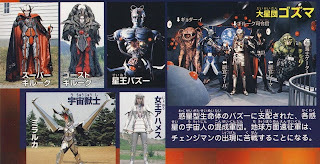 It may be a military themed Super Sentai but you can't deny the inspiration also has some space elements. What was amazing to know is that Changeman and Juspion took place in the same year. Juspion was broadcast early February and Juspion was broadcast early January of 1985. 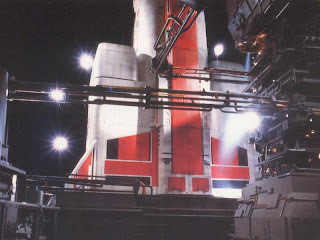 The Shuttle Base scenario may make one think the series happens in space. No, the series doesn't happen in space but it's all about how Earth is caught in conflict with the Great Star League Gozma. Still, the series has a lot of incidents involving space as some guest characters are aliens themselves under the rule of Gozma. I find it to be a pretty interesting series as how Earth gets involved in an intergalactic conflict even if 99% of the events are stuck on Earth. Considering I'm familiar with Fiveman and now Changeman had me throw in the comparison. I thought about some stuff that Changeman did right and Fiveman did wrong. The Great Star League Gozma is pretty much a huge intergalactic empire ruling on the survival of the fittest. The villains themselves are a terrifying bunch but some of them have a human side. I tend to call Star King Bazoo as the "One true Dark Specter, monarch of all evil". It's all because of how he carries out his role as the main villain of Changeman. He just appears as a limbless torso and he gives orders. Even in his illusion form he really still gives me chills. He has a terrifying voice provided by Seizo Kato who would also provide the voice of Maskman's Emperor Zeba, Fiveman's Vulgyre as Zyuranger's Dai Satan in terms of being the final villain. I feel that makes him way more intimidating than the Dark Specter. 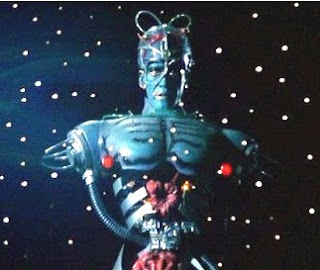 I think he could have been a much better boss for the United Alliance of Evil than the Dark Specter of Power Rangers in Space. He may have even gotten rid of Darkonda's ambush without having been blown up himself. 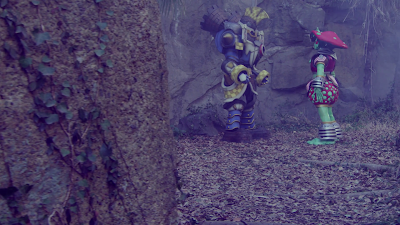 It would even be impossible for Astronema to use Bazoo's power to produce the Psycho Rangers. He keeps his true form hidden which he's actually a planet-sized lifeform known as Gozmaster. He's not easily taken down and the Changemen's victory over him is oh so good. The recurring villains themselves are a vicious bunch with the exception of Gator and Gyodai. I could see some parallelisms between Buuba and Shiima with Ecliptor and Astronema. Okay, they both have their own way of doing things but IMO, I felt the way Shiima and Buuba got carried out was better. Buuba presents himself to be a space pirate who has an identity crisis. Shiima is the princess of Planet Amanga a planet that was also ravaged under the Gozma. She was taken away as a child and was raised to be evil. Buuba cares about Shiima to the point it helped define the finale arc. I still think that Buuba freeing Shiima from her state of being brainwashed and evil was better done than how Astronema met her redemption. Buuba's death is in fact where he chooses to die a warrior's death than to die dishonorably. His backstory as a space pirate starts to show a more noble side of him in contrast to Gozma's cowardly ways. Gator doesn't exist solely for comic relief as she's got his backstory to where he's forced to serve Gozma if he ever wants to see his family again. As for Commander Giluke he really shows himself as a persistent commander who never gives up. I ended up thinking that Captain Garoa in Fiveman from Fiveman ended up as Giluke gone wrong. He ends up getting banished by Star King Bazoo into space but showed he really has some persistence. He isn't the type to give up so easily. Just think he proceeds to even defy death in the Graveyard of Space. He wants to get revenge on his former ally Ahames who backstabs him earlier in the series. He returns as Ghost Giluke, Super Giluke (by getting some Rigel Aura from a now teenage Nana) and eventually as Space Beast Warrior Giras to show he's not the kind of person you can beat easily. What's interesting to know is that he and Ahames once tried to get rid of Star King Bazoo but failed. Ahames arrives as a game-changing villain who manipulates both the heroes and the villains for her own cause. She arrives showing she's not someone to be messed with as the Changemen learn she's a terrifying foe. Shima's heard of how terrifying she can get. She betrays Giluke just to get the Rigel Aura from Nana who was about to go from childhood to teenager in one easy step. She also gets Jyangeran with whom she uses to menace the Changemen. She also wants to stop Giluke from returning for her own agenda. I guess she really wants to get rid of Bazoo and take over the Universe for herself. Her tenacity is also something as she refuses to become the Star Beast Maze at first. That alone caused her to separate from her monster form while she loses her mind begging Star King Bazoo to restore her planet Amazo. I feel her karmic death is a well-deserved one considering how she's pretty much a very cruel character. 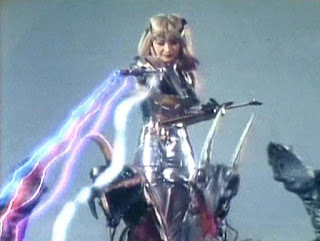 I feel like she may have also been some way an inspiration for the really wicked Trakeena in Power Rangers Lost Galaxy. Pretty much Changeman is one of those highly innovative series that truly changed Super Sentai for the better. I'm looking forward to watching more of the classic Hirohisa Soda series so I can have a better scope of his writings. At 55 episode, it was the longest Super Sentai series before TOEI decided to integrate the Ishimori' series as Goranger is the longest series to date. The series is totally unlikeliest theme that can fit the military in space theme as they are western mythical creature!?!? 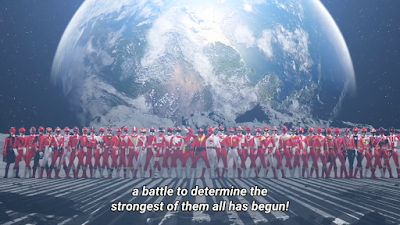 If the theme is like Flashman, Fiveman, Megaranger, and Kyuuranger would match. It did took me 21 years to realized the the mismatched basis of the series. I thought Changeman should have been a mystical series like Magiranger and Goseigers. 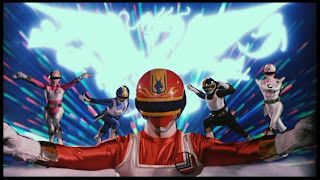 It did started the 5 piece super cannon that have been done by Zyuranger, Megaranger, Go Go V and Timerangers. Unfortunately as a prop and merchandise Sentai is very much in the poor house as they only had the Change blaster sword and shield combination. All those characters of Dragon, Griffin, Pegasus, Phoenix and Mermaid had so much fight personality and flashy cheoreography that they should have Sword, Hammer, Spear, dagger, and Bow Gun. Series such as Jetman, Go Buster, and ZyuOhgers suffer in lack of personal weapons. Their mecha of the Change Robo is the ugliest robot next to all those future robots we would have during Kyoryugers, ToQgers,Ninningers. Overall, thanks to the wonderful story telling and fight choreography from JAC as they where at their hottest during the early to mid 80s. Change sure NEVER STOPS!! !